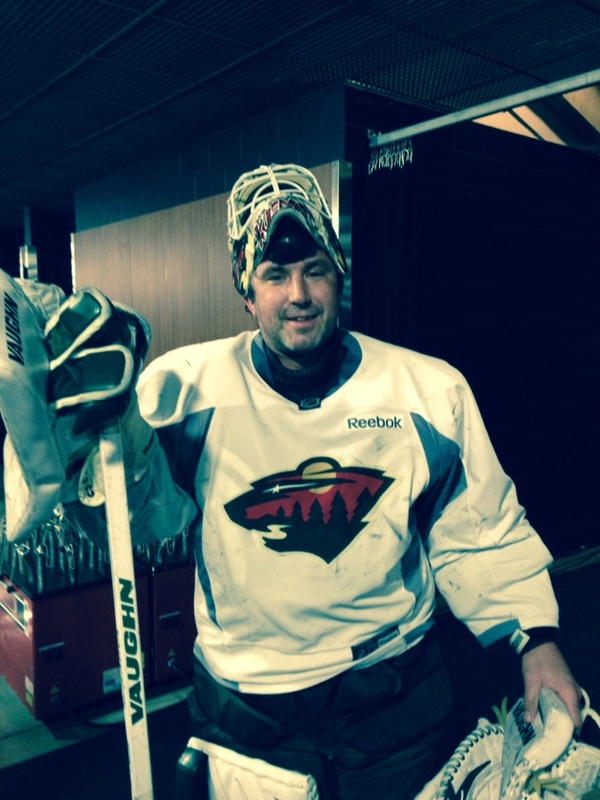 Yes, that was Andrew Brunette, the third-leading goal scorer and fifth-leading point-getter in Wild history, in goal at the end of today's Wild pregame skate. Darcy Kuemper had to leave the skate early because "he was not feeling well," said coach Mike Yeo, so Brunette followed tonight's starter vs. the L.A. Kings, Ilya Bryzgalov, off the ice. Little did anybody realize that Brunette would return to the ice wearing Kuemper's gear and mask so the assistants could work tonight's scratches -- Dany Heatley, Mike Rupp, Cody McCormick and injured Keith Ballard. As you can see above, Brunette, who used to do his best work around the crease, was a little deep in his crease, and as you can see, the shooters were able to fill the net pretty easily. "It would help if a couple of those guys would pick up guys in front of the net," Brunette joked afterward. "Bally didn’t pick anybody up the whole game. They were tap-ins. What could I do?" Assistant coach Darryl Sydor's scouting report, "He looked a little bit like Ken Dryden, really low. There’s a little room blocker side. Speeds’s not that good." Brunette said, "I thought I had a better glove. Heater kept burying them glove side all the time." Brunette said he played a little ball hockey goalie back in the day, but his excuse for his "terrible" goaltending today was Kuemper's pads were too big and he was wearing player skates. @Russostrib there cannot be less flexible goalie than Brunette, who used to lead stretches w "everyone touch your knees"
In the meantime, Yeo wasn't specific about Kuemper in terms of was he not feeling well because he's ill or because he got hurt. As of now, there's no word as to whether Kuemper will be able to back up. If he can't, the Wild would either have to parachute John Curry or Johan Gustafsson into town (don't know if that's even possible this late with the team in L.A.) or if the Wild may need to sign a goalie quickly Paul Deutsch-style. "We won't dress Bruno, for sure!" GM Chuck Fletcher said via text. Fletcher also said there would probably be a Kuemper update later after the team gets more info, so this is obviously an injury. Remember, this second-half ride for Kuemper began Jan. 7 in L.A. because Niklas Backstrom got a cortisone shot to his core muscle the day before and because Josh Harding was suffering from complications from MS. 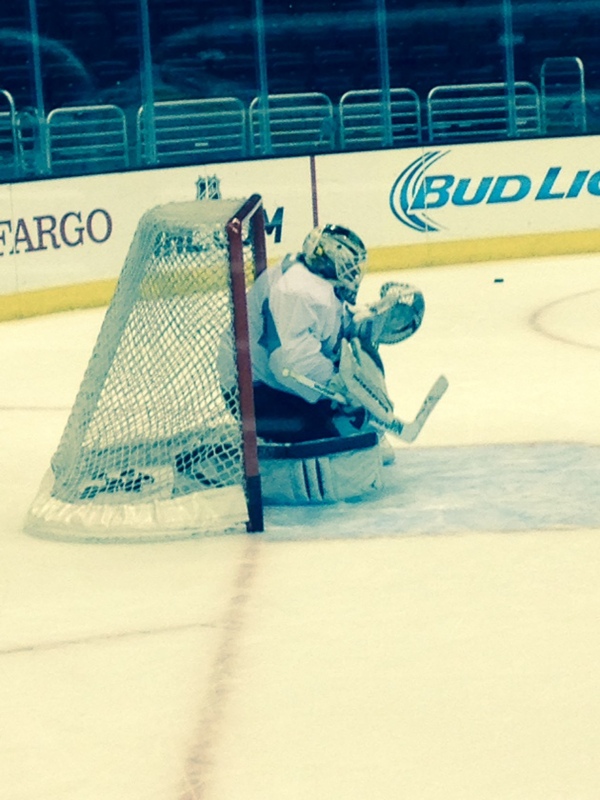 There's something about L.A. with Wild goalies. In Dec. 11, Matt Hackett had to make his first career start in L.A. (victory) because Harding got hurt in San Jose and Hackett relieved him for his first career win. Same Wild lines as I blogged yesterday. 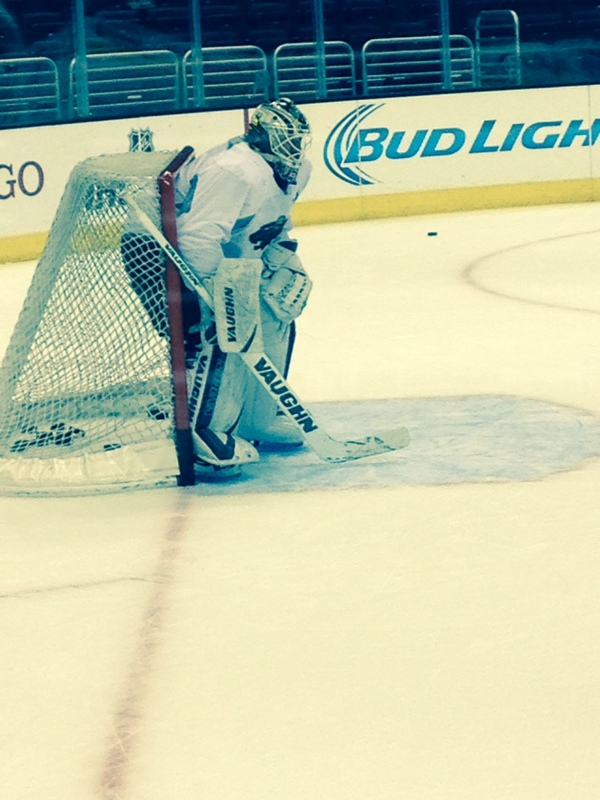 Jonathan Quick expected to start for the Kings. Southern California native Jon Blum will play his 100th NHL game tonight. Ballard though is "very close" to returning, said Yeo, maybe Thursday in Chicago as long as he continues to feel good after Wednesday's practice in Chicago. Yeo on Heatley: "The pregame skate in Phoenix, the assistant coaches really complimented him in how hard he worked in all the extra work he was doing. Yesterday, real good practice. So he’s doing everything that he can right now. That’s the key for me, use these practices to build the confidence back up, to get feeling good about yourself, and then that way when you get back in there, you’ll be ready to take advantage in it." Yeo on struggling Nino Niederreiter, who had a great game last time the Wild played in L.A.: "He’s trying to bring the physical presence. It just seems like plays are happening fast for him right now. Seems like he’s kind of rushing things with the puck and that to me just points to confidence. We’ve talked to him, we’ve challenged him, but at the same time we’ve tried to pat him on the back and let him feel good about himself. At the same time, I think he sees himself bouncing from line to line, he hasn’t really been able to find a place and stick with somebody. There’s no question that we know there’s another level to his game. He’s just got to take a deep breath and settle down and play the game." As I mentioned the other day, J.P. Parise is on the Wild road trip. He's attending the meetings, going on the team plane, etc. It's his personal father-son trip. How'd this come about? Fletcher discovered that father-son trips were not done in New Jersey, so J.P. Parise, a former NHLer, has never gotten to go on a father-son trip with Zach. So last week, Fletcher invited J.P.
"I said, 'Oh my God, I'm in," J.P. Parise said. J.P. was blown away, saying, "this organization, the atmosphere is so inviting." He had a lot of cool things to say today actually and I'll do more of an in-depth story in the next couple days. He got to watch his son score twice in Phoenix. The second goal -- the empty-netter -- actually allowed Zach to pass J.P. with 239 goals. "The nice part: It took me 12 fricking years to do it. He did it in seven," said J.P. Parise, howling with laughter. Zach did end up getting the puck even though a Coyotes player fired it the length of the ice into the Minnesota net. Bryzgalov comically let it go in. Russo: Wild looks to build off Saturday's solid effort Monday in L.A.